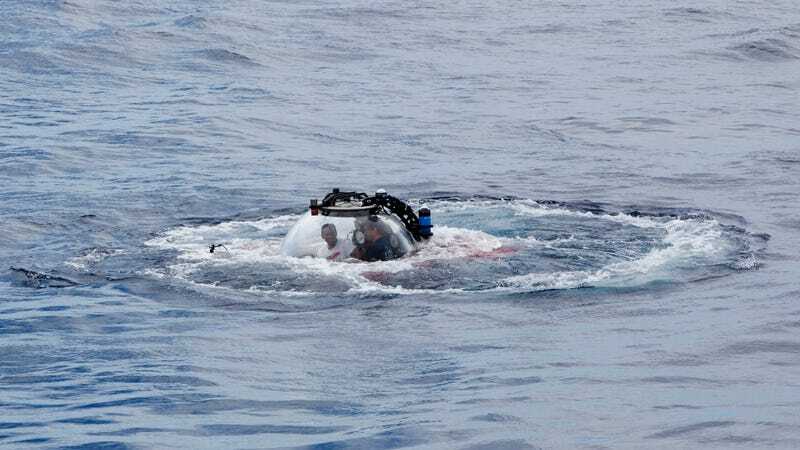 There goes Seychelles President Danny Faure going underwater. That’s the choice Seychelles President Danny Faure made during a live address he gave Sunday. He sat in a mobile glass dome more than 400 feet beneath the Indian Ocean looking cozy as hell. And his message was clear: The oceans need protecting, and we humans are seriously failing them. And here is President Faure actually underwater. The East African island nation of Seychelles is partnering with the Nekton Oxford Deep Ocean Research Institute to explore more of the Indian Ocean, where the 115 islands comprising the Seychelles are located. This presidential address is just one small piece of the massive mission, First Descent, which will wrap up in 2022. But that doesn’t make it any less historic. In fact, this was the first live address underwater by a president, according to the Seychelles government. Maldives Cabinet members did something similar in 2009 when they held a meeting underwater donning scuba gear and using only their hands to communicate. Island nations don’t play because sea level rise, coastal erosion, and the loss of their reefs could literally put them underwater. But rising seas are far from the only change that’s afoot. Plastic pollution, ship traffic, and global warming threaten the ocean ecosystems we depend on in countless ways. The Nekton expedition through the more than 42 million square miles that make up the Indian Ocean will first focus on the water surrounding Seychelles, which has committed to protecting 30 percent of its oceans by 2020. So far, the mission’s conducted 75 dives related to Seychelles, according to the government. This research should serve as a baseline of sorts to get a better sense of how the oceans are changing. These waters are home to a wide diversity of creatures, like the manta ray and corals President Faure spotted during his descent into the dark, and threatened species like the dugong. They’re all threatened by ongoing marine pollution and, of course, climate change. President Faure is calling on the rest of the world’s leaders to take action and protect their oceans. He kept it 100, telling governments to “walk the talk.” Saving the sea will require a concerted effort; it’s something we need to do together, he said. “We can’t wait for the next generation to solve it,” Faure said. The kids are up to the challenge, but he’s right. The time is now—and it’ll take all of us to fix the damage we’ve done.